(by Daniel Allott, National Review) – The first thing one notices about Brian Skotko is his winning smile. The second is his pants. They are, I think it is safe to say, rather absurd. Colorful and loud, and often paired with a conservative dress shirt and tie, Skotko’s pants invite mockery. 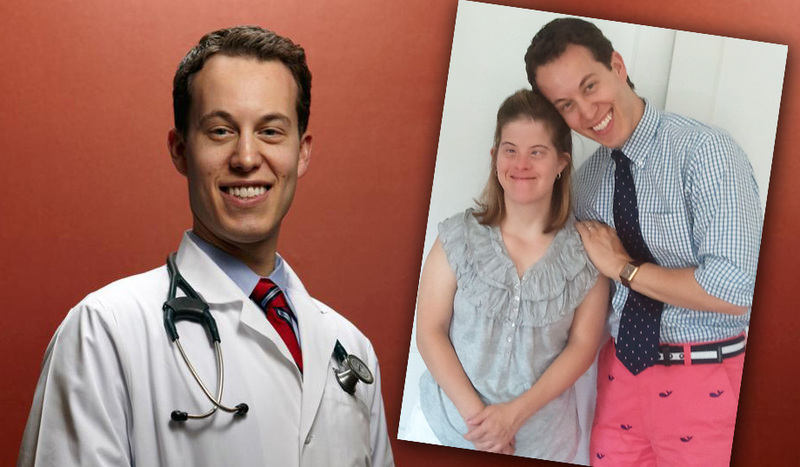 As the brother of a woman with Down syndrome (DS), Skotko took exception to the notion that an extra chromosome ruins everything — or anything, for that matter. “Mock my pants, not my sister” provides a glimpse of the passion with which Skotko advocates for his sister and all people with DS. But Skotko is much more than an advocate. He is also one of the country’s leading medical clinicians, geneticists, and Down-syndrome researchers. The goal of his work, as he explained it to me when I visited him at Massachusetts General Hospital, is to make “tomorrow better than today” for people with Down syndrome. Put another way, Skotko is using his extraordinary talents to help move society beyond mere tolerance for people with DS and toward a celebration of them. Skotko grew up in Strongsville, Ohio, a suburb of Cleveland, as the only son of an industrial-supply salesman and a grade-school teacher. Skotko has two younger sisters, Allison Hanselman, 32, and Kristin Skotko, 34, who has DS. Skotko is, by all accounts, an exemplary brother and son. In an e-mail, his mother, Sharon Skotko, told me that Brian “has always been the perfect son. We have been so blessed. There was never one instance where he ever disappointed us.” Sharon told me that Brian has called home every day since leaving for college nearly two decades ago. Because there were few resources available to families raising children with DS, the Skotkos helped launch a parent support group, one of the first in their area. A group of six to ten parents of children with DS would gather once a week for dinner and fellowship. Brian excelled in school, and after becoming valedictorian of his class at Saint Ignatius High School and a USA Today first-team academic All American, he enrolled at Duke University. Skotko smiles often, and his smile broadened when I mentioned Allen Crocker, photographs of whom Skotko has posted throughout his office. Crocker was a developmental-behavioral pediatrician who taught at Harvard and directed the Developmental Evaluation Center at Boston Children’s Hospital for many years. Posted at NationalReview.com on December 17, 2014. Reprinted here January 15, 2015 for educational purposes only. May not be reproduced on other websites without permission from National Review. 1. The purpose of an editorial/commentary is to explain, persuade, warn, criticize, entertain, praise or answer. What do you think is the purpose of Daniel Allott’s editorial? Explain your answer. Visit the National Down Syndrome Society website: ndss.org.